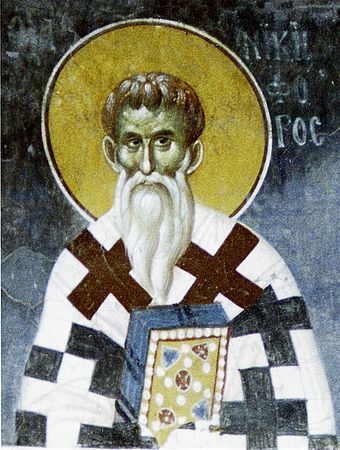 In traditional icons of Saint Nikephoros, Patriarch of Constantinople from 806 to 815 A.D., he holds a Gospel book, since a primary task of a Bishop is to teach his flock the teachings of Christ. However, in his Chronography, to which is appended a list of the canonical writings accepted as Holy Scripture, followed by a list of disputed, or antilegomena, texts and then apocryphal texts, there is one book that is not listed as a canonical book of the New Testament that is normally listed today, but is rather placed among the antilegomena - namely, the Book of Revelation. He does not say why he places the Book of Revelation among the antilegomena, but it is significant that a Patriarch of Constantinople and a Saint of the Church from the ninth century rejected the Book of Revelation as canonical Scripture, and placed it among other disputed books such as the Revelation of Peter, the Epistle of Barnabas and the Gospel of the Hebrews.